If you run through just about every style that can be considered as roots music this band can not only play them but each of those styles comes as naturally as breathing to the three talented members. This new album, perhaps even more than its six predecessors, one of which was a live album, proves the point almost beyond belief! It is rare, if it has ever happened before, that a 'covers' album has ever sounded as authoritative and natural as this. The twelve songs all have different authors and indeed styles, but the whole thing blends and holds together beautifully as if they were all band originals, albeit stylistically diverse. Of course it helps that the band is so talented as well as being well versed in old timey, alt. country, bluegrass, country, jazz, folk and blues. The three regular band members are Pete Bernhard on guitar and lead vocals; Lucia Turino plays bass and vocals, with Cooper McBean on guitars and lead vocals. Pete takes lead vocals on all except two songs with his incredibly manipulative vocals enabling him to sound natural on pretty much any style. The two that Pete doesn't sing both have on lead the also excellent Cooper McBean whose style is perfectly suited to the more straight country leaning songs. Helping out on this tremendous album are artists of the calibre of Jerry Douglas, Chance McCoy, Tim O' Brien, Daryl Scott and even Emmylou Harris on one song. None of these artists over play their hand, always playing and singing just what is required to add a little more colour rather than going into any histrionics, perhaps an example of the esteem in which this trio is held. Things get under way on this most stylistically diverse album with Robert Johnson's Drunken hearted man, the banjo and excellent vocal soon joined by bass, slide guitar and percussion on an up tempo song that includes lovely feminine harmonies and tremendous fiddle on a song that is part alt. country, part hillbilly! There is a nicely restrained approach on Kris Kristofferson's Chase the feeling, here a gorgeous 'country' ballad with lovely steel guitar, a chugging percussion and bass, with excellent lead and harmony vocals on a song that has a strong otherworldly atmosphere. There is a slow mournful harmonica start on the classic Townes song Waiting around to die before the lead vocal comes in supported by restrained metronomic percussion and bass. This reworking is so good that to me it is at least a match for Townes original and when you add the deep twanging guitar that comes in later on it is given a ghostly haunting atmosphere exacerbated by Emmylou's harmonies. I am the man Thomas is propelled by a lovely banjo sound and driving percussion with Pete's speedy lead vocal added to by fiddle, on a bluegrass song that has an old time feel with the hugely talented Chance McCoy on fiddle and Jerry Roe on metronomic spoons! What would you give (in exchange for your soul) is a gorgeous bluegrass gospel song with the excellent lead vocals perfectly complemented by Lucia and Tim O' Briens high lonesome harmonies, with a lovely blend of instruments that includes dobro, bass, banjo and mandola. Finally we are treated to Angel of death, as befits its title a haunting, spooky version of a classic Hank Williams song with a tremendous lead vocal from Pete and harmonies from Lucia and some hugely atmospheric playing from Jerry Douglas on steel guitar, Duane Eddy playing electric guitar, and Chance McCoy, fiddle. 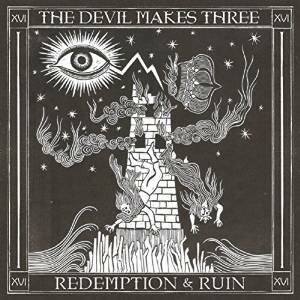 This is a tremendous album in its own right that despite none of the songs being band originals none the less shows the Devil Makes Three in all their rootsy glory! Not only stylistically diverse but played and sung by a band who are at the top of their game and unafraid to put their own stamp on some great songs, some well known, others less so, but all having been treated to a quite original interpretation by one of the best bands around.